I want to love Teran, really I do, but I don’t even know what to call it at this point. 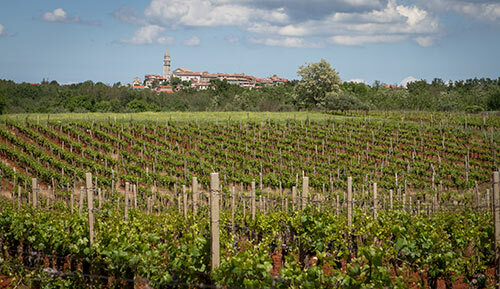 The wines bearing this name had been made in Istria, Croatia for some time, but as joining the EU got closer, Slovenia pulled the rug out from under those using the name of the grape. Essentially what happened was the same thing that happened in Spain with the grape Carignan or the non-French name of Cariñena/Carinyena. There happens to be a Spanish denomination of origin called DO Cariñena and they blocked the use of the name of the grape, Cariñena for wines despite the fact that nearly no Cariñena is grown in DO Cariñena and the French could still use Carignan. Confused? Well, it the same problem with Slovenia and Croatia. The Slovenes have registered “Teran” as a Protected Designation of Origin for their wines from the Kras Plateau despite the fact that it’s actually the Refosco/Refošk grape being used in the wines. While seemingly related, they are in fact different grapes from different regions. You can read the Slovenian take as well as the Croatian and you’ll probably come away as confused as when you started. I have no idea how this has ultimately played out as when attending Vinistra last year, everyone was worried, but no one had a solution and I’ve yet to hear one as I still see these Istrian wines being called, Teran. With the problem in Spain, Carinyena is labelled as Samsó which is a weird name that has some lineage I don’t fully understand nor care to as I still call it Carinyena like most everyone except on official wine labels. Ultimately it seems that some new name will have to be created as the EU laws are pretty set and Croatia lost its chance by not contending this back in 2009. Maybe they should just call the grape Croran, in fact, let’s do that. There is another issue in that those who are ampelographers in the area have found that Croran and Refošk are actually the same grape, but from different soils–red and white respectively. The minor differences in appearance are just mutations of the same grape. I don’t have any article links to this, but if it’s true then in theory Croran could actually be called Refošk without an issue and end this ridiculous matter but those who know don’t want to really be publicly forthcoming about this as it’s a political mess at the moment, although to me this seems like it could end the debate. If this isn’t true then it may be something of a blessing as honestly, like I said, I’ve really tried to get in to this grape but crap it’s hard. Unless really tamed, the result can be this rugged, highly acidic brash wine that, especially when grown on the red soils of Istria at lower elevations that tastes like fermented rusty nails. I know that’s a rough thing to say, but it’s true and I don’t know if it’s due to winemaking techniques or the common tendency to extract the hell out of red wines in Coastal Croatia, but it doesn’t work. It can blend well and those are some of the most successful wines made of the grape, although Croatians have vastly preferred single varietal winemaking to date. It should also be noted that in the Great Teran Debate that Refošk–both the ones made in Istria and those made in Slovenia–are radically different in flavor profile and this grape is much more evenhanded than Croran. That said, there are several wineries who manage to beat it in to place such as Piquentum, Benvenuti, and, depending on the year, Coronica. There are probably others, but I’m not the one authoring the main guide so only time will tell once that’s finished. There are some secrets to tasting a wine made of Croran properly, thus the title of this article. The first is serving temperature. The wine definitely should be below 20C. Then, make sure to let it decant, a lot. Even the young wines seem to enjoy at least an hour in the air to tame down a little; reserve wines even more so. It also happens to be one of those wines you can open, have a glass or two of, put the cork back in and open the next day to find it just dandy. I exercised this when tasting 2013 young wine from Geržinić. Upon first opening, it was brash as hell with the standard metallic aromas and flavors. An hour later these gave way to balsamic, dark cherry, white pepper, and a bit of menthol. The body is full of young red cherry flavors, and dried fig with a large mouth feel that gives way to a good deal of acidity that lingers in to the finish and doesn’t want to scale back. This is what I observed over four hours of tasting. The next day it had rounded out more and was in line with how I’d expect a young wine to taste. Another was the Fakin il primo Teran 2012. Upon first opening it was just woodsy with heavy cedar and resin notes. Being an aged wine, it opened up surprisingly quickly though. After a half hour, light red fruit notes and a minor touch of licorice and menthol came out. It was smooth and even tempered in the body quite early on with a finish full of dried cranberries. This wine overall held a good deal more elegance to it. While not blowing me away, Fakin managed to tame the grape in what was a tough, drought-ridden year. I’m not sure what the future holds for Croran, but I’ve always a fan of seeing native grapes grow. It’d be a horrible shame if they started ripping out the vines and sticking in Syrah or worse, Merlot. I just hope that the name issue gets sorted and more wineries follow in the footsteps of those I mentioned to make elegant takes on this grape.